Researchers find strong correlations between access to green space and increased levels of physical health and happiness. Photo by Mark Carter/Flickr. As much as cities can be drivers of economic and social progress, sometimes it’s downright stressful to live amid the hustle and bustle of today’s urban centers. To escape this stress, many urban residents take refuge in green public spaces, nature preserves, or even the occasional pocket park. While the concept that urban green space benefits physical and mental health may be intuitive, two recent studies have attempted to take a more scientific look at the health impacts of access to urban green space. It is easier being green! First, a study from the University of Wisconsin found that, on average, residents claim to be happier the more green space is located in their neighborhood. The study drew conclusions from a statewide public health survey of over 2,500 residents of 229 cities and towns, who answered questions on their levels of depression, anxiety, and stress. Their responses were then examined against an index of the vegetation per square mile in their neighborhood. Perhaps the most striking finding of the study is the fact that happiness was more strongly correlated to green space than socioeconomic status. Participants living on blocks with 10% fewer green areas than the average were more likely to report stress and depression. Following this logic, a ‘poor’ resident living in an area with more trees and open space would report being happier than a ‘rich’ resident living in an area without access to green space. Another study, this one by the University of Exeter in the United Kingdom, uses 18 years of survey data from over 10,000 participants across the United Kingdom. Its analysis shows a strong correlation between access to green space, self-reported well-being, and even physical health. The researchers even found that the sensations associated with living close to green space yield similar feelings and levels of satisfaction to getting a new job or getting married. 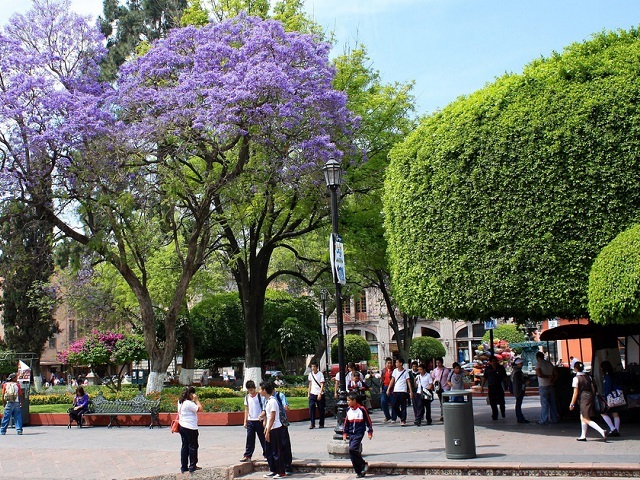 While it may seem to be common knowledge, it never hurts to reinforce: green spaces in urban centers are essential to building healthy, livable cities. And while most urban residents have understood this connection for years, it’s relatively new – and quite encouraging – to have both qualitative and quantitative research backing up this belief. Cities, meanwhile, are taking note. Rio de Janeiro recently opened the largest park in the city, the Parque Madureira, blocks from both a TransCarioca bus rapid transit (BRT) line and commuter rail. Rio is also home to the Tijuca Forest, the world’s largest urban forest. Mexico City is leveraging public-private partnerships to revitalize its lush Chapultepec Park for public enjoyment and recreation. But parks don’t have to be big to have an impact. The parklet concept, born in San Francisco, is now catching on in cities across the world, including serving as an important part of New York City’s public space revolution. What is common across each of these cities is the desire to improve quality of life for residents and the recognition that safe, green, public spaces are vital to do so. As the world population urbanizes and cities grow at breakneck speeds, city leaders must keep this mindset if cities are to grow sustainably and become more livable environments. A version of this post was originally published in Portuguese at TheCityFix Brasil.